I’m so happy about today’s recipe, not only because I truly love to make bread but also because this is one of the best recipes you could make for the holidays. 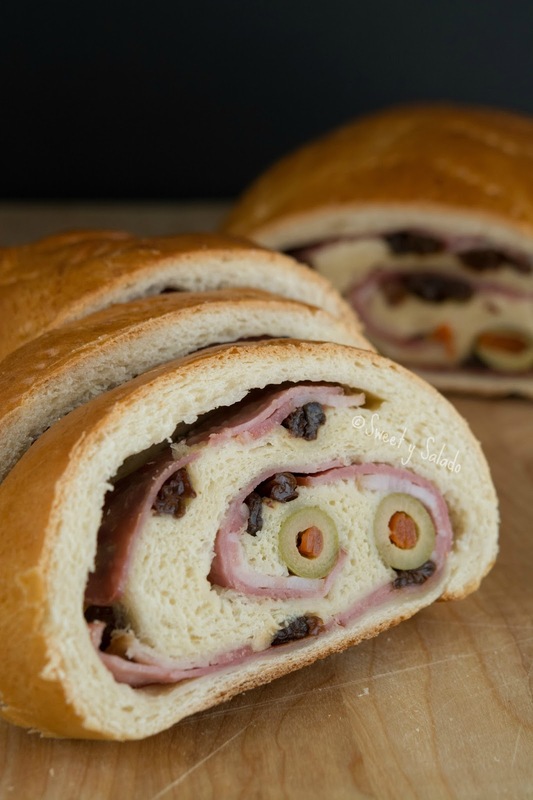 For those who are not familiar with it, pan de jamón or Venezuelan ham bread, is a very traditional recipe that is usually made for the holidays in Venezuela. 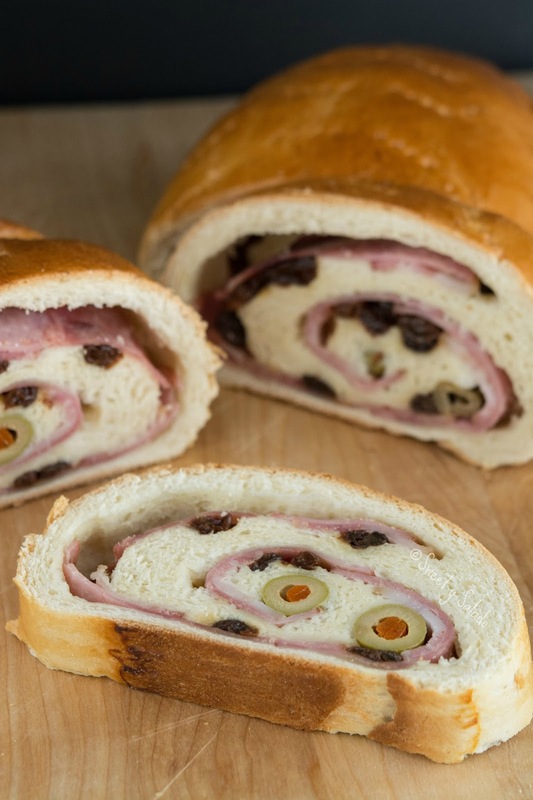 It’s easy to understand why people love it so much because the combination of ham, bacon, raisins and olives wrapped around with a delicious crust is incredible, especially if you serve it with a nice glass of wine or any holiday drink, like Colombian sabajón. The very first time I made it I didn’t really like it, to be quite honest. 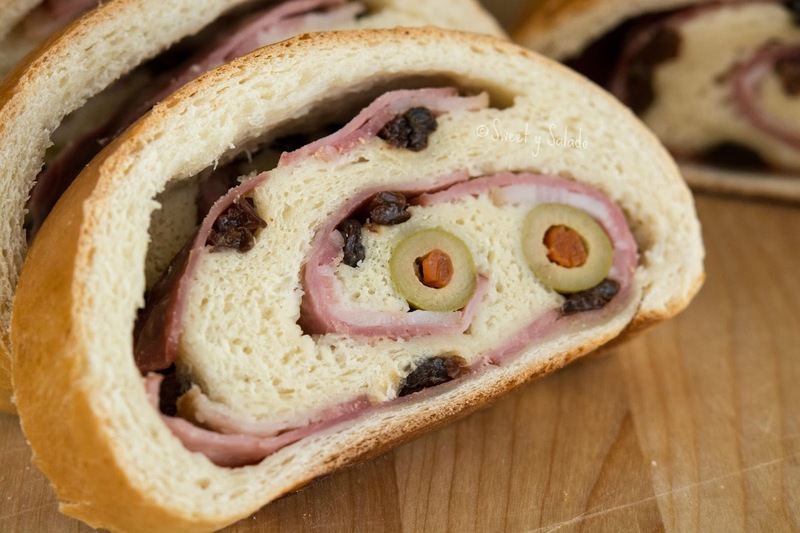 And it was mainly because I hated the taste of the olives, I just felt that they ruined the entire loaf of bread. Turns out, I had used way too many by scattering them all over the dough. Big mistake. 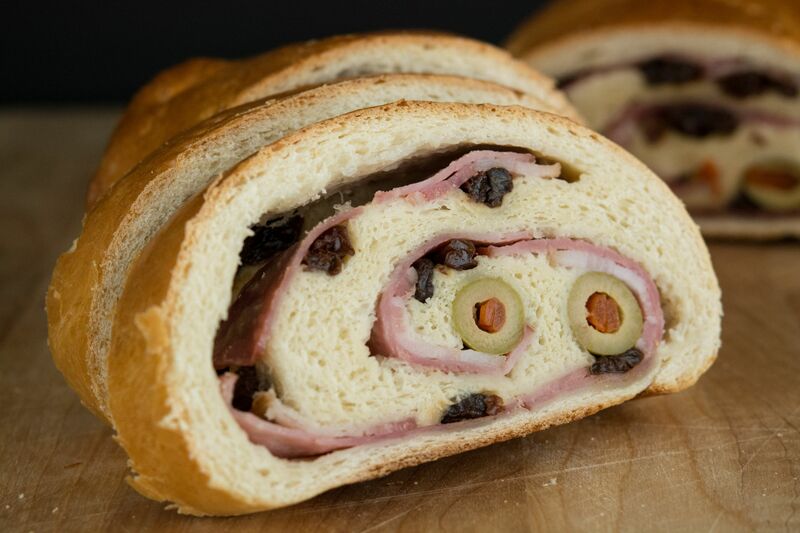 I then did more research on how to really place all of the ingredients before rolling the dough and discovered that the best way to do it is to make two rows of olives so that each slice of bread ends up with just two pieces of olive. Problem solved! And as with any other recipe, feel free to add or omit any ingredient that you want. However, I really recommend you make it as is because the combination of flavors that you will get, sweet and savory, is unlike any other. Believe me when I say this, you’ll love this recipe so much that you will end up making it every year during the holidays. Using a Stand Mixer: Mix milk, dry yeast and ¼ tsp of white sugar in a small container and let it stand for about 5-8 minutes or until a foam forms on top indicating that the yeast is activated. Add one large egg and melted butter and stir. Set aside. Place the dough on a flat surface and with the help of a rolling pin flatten it into a rectangle that's about ¼ inch (about ½ cm) thick. (Mine usually rolls out to measure about 17 x 14 inches (43 x 35 cm). Working lengthwise, place the slices of ham on top of the dough in a single layer leaving a border of about 1 inch (2½ cm) at the bottom of the rectangle and about ½ inch (1,27 cm) on all other borders. You can fill in the gaps with more ham if you want. Now place the strips of bacon on top of the ham leaving a space of about 3 inches (7½ cm) in between. Scatter the raisins over the ham and bacon. Make a row of olives close to the border at the top of the rectangle and another row close to the middle. This will ensure that each slice will end up with about two pieces of olive. Grab the top border of the rectangle and wrap it around the first row of olives. Continue rolling until you reach the bottom to form a loaf. With your fingers wet all the borders with warm water and pinch them (sides and bottom seam) to help seal the dough. Transfer the loaf, seam side down, into a large pan covered with parchment paper or silicone mat. Cover it loosely with plastic wrap and let it rise in a warm place for about 45 minutes. Tip: You can use the microwave method to help it rise. Pre-heat the oven to 350ºF (180ºC). Beat the second egg with 1-2 tbsp water to make an egg wash. Brush the top of the loaf with the egg wash and then pierce it with a fork. Bake for about 40-45 or until it's golden brown on top. Remove from the oven and let it cool for about 10 minutes before serving.